Last week during one of our frequent forays to the city library downtown, my eye caught a glimpse of a very beautiful and different nativity in one of the shop windows nearby. Naturally I had to check it out more closely. It was a very different nativity scene than the ones we’re accustomed to seeing and I loved it. Mary and Joseph, the baby Jesus and three wise men, and all the corresponding animals you associate with the manger scene were randomly nestled together in a straw lined wooden dough bowl. The difference was not the dough bowl presentation but that Mary, Joseph, the three wise men and the baby Jesus were South or Central American. They were cast in clay and painted with vivid browns and turquoise and tiny splashes of a contrasting reds. Beautiful. I wondered how much it cost. No matter how much or how little, however, Hubby and I have resolved not to continue collecting, so the question was moot. It’s time we start downsizing and not collecting more stuff, but my mind and heart began their arguing anyway. Mind: You already have too much junk. Don’t even think about another collection! Heart: Oh but wouldn’t this be beautiful next to the one I already have? It could be a special collection. Gee, I wonder how much it is? I immediately called Hubby back to see them too. He’s always several yards ahead of me when we’re walking along any storefront, because I’m an inveterate window shopper and tag-along-too-lou. He didn’t mind. He thought they were pretty nifty too, and was curious about their cost as well. As it was near the library’s closing time and a Sunday, the store had closed so I still don’t know the price, and it’s probably just as well. I suspect his mind and heart were arguing as well. We both seem to have a soft spot for unusual nativities. It was the fall 1994 when I was off on a visit to daughter #1 in California for a few days, that Hubby found himself free to sneak off every day after work plus a couple of lunch hours and join several ladies in artistic pursuits at a ceramic studio in Clinton, Tennessee near Oak Ridge. I knew nothing about this of course; all I knew was he seemed a little too eager to have me disappear for a week, and I had the sense he was glad I was leaving. A few months later, when we were decorating the house for Christmas, he appeared out of the garage with a mysterious box, set it in front of me, and asked me to open it. It was a little early for a Christmas present, he said, but I would understand after I opened it. This is what I found, each item individually wrapped and carefully packed into the box. He had spent all the free time he could muster the week I was gone laboriously going through the steps of cleaning the green ware, glazing and firing, and painting in suitable colors, then back to the studio for a final glaze at what he described as an old lady’s studio where the only other people were women of various ages each working on individual projects. Of course when they learned what he was doing surreptitiously as a gift for his wife, they were totally charmed. And when I saw this, and thought about how many hours it must have taken, I was a little jealous of that time spent with all those women I didn’t know. For weeks after I teased him about spending so much time with the old lady who owned the shop, so one day when we on our way to Oak Ridge he stopped by and introduced me. She really was an older lady who clearly thought he was great. After all there aren’t too many men, that I’ve ever known at least, who would have gone to so much trouble and effort to surprise his wife for Christmas–not by spending a lot of money–but by putting so much of himself into making it as a surprise. I was showing it to a couple we knew and considered good friends and was somewhat taken aback at their response, and got the distinct impression they were slightly offended that the figures were represented as Indian as they knew neither of us were overtly religious. Perhaps they preferred their Christ only white with blue eyes and white skin and blond angels hovering nearby. I had the feeling they thought we were mocking the Christian representation of the birth of Christ. Oh what would Jesus think?! Of course we weren’t, and I’m gratified that these days Christmassy things are looking a lot different. There are variations everywhere on the standard nativity scene. Mary may be clad in a country woman’s shawl with a fedora hat and Joseph may be wearing a poncho. 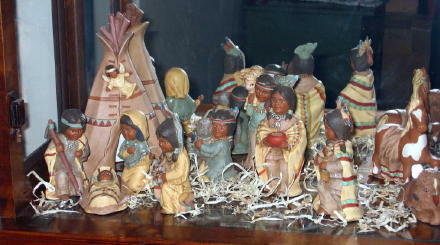 The baby Jesus may be depicted as European with Italian features and the wise men may look like Colombian natives. I even saw a scene with whimsical rubber duckies. Regardless of the ethnicity or depiction of the figures or the religion it represents, nativity scenes re-capture the spirit and beauty of Christ’s lowly birth and remind us what Christmas is all about. And you know what I think Jesus would think? Jesus, at least the Jesus I imagine from the Bible stories I’ve read, would think it’s just fine. I LOVE it!! Really, really think it’s just awesome and beautiful. And now, how do I get the snowflakes?? You have the greatest husband around!!!! You are so blessed!!!!!! I always liked the expression on the indian baby jesus’ face. he looks kind of angsty or cross. A treasured gift made with love that goes on for a lifetime. Alice, you are a very fortunate lady! They are beautiful and what a wonderful surprise! Pingback: … not a surprise, but thrilled anyway … « . . . 'tis the SEASON . . .